The business and growth minister, Troels Lund Poulsen, and the environment and food minister, Eva Kjer Hansen, have today presented ten projects that have been approved as part of new plans for coastal development in Denmark. The ten projects (the report is here in Danish), which include water parks, resorts and a safari park, aims to strengthen growth in the tourism sector in the coastal areas of Denmark. “These are ten projects that will help attract more tourists to the Danish coasts and generate growth and jobs locally,” said Poulsen. In total, there were 20 projects on the table for the government to consider. All of them lived up to the government’s criteria concerning the development of coast and nature tourism. The next step for the ten chosen projects will be a planning phase. They will all need to be approved by the municipalities where they are located. The coastal development comes in spite of over 120,000 Danes having signed a petition organised by the nature conservation organisation Danmarks Naturfredningsforening (DN) that aims to prevent the government from developing the free Danish coastline. 1. 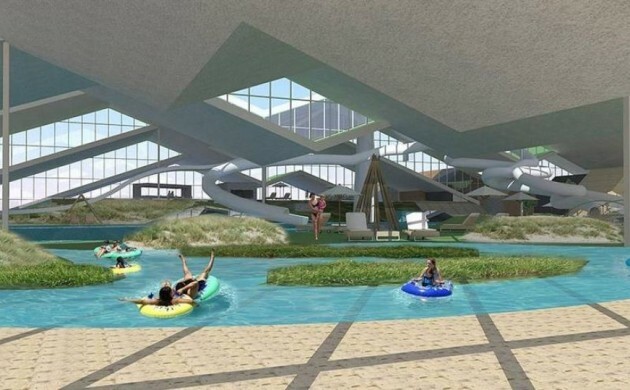 Ringkøbing-Skjern Municipality, Søndervig Feriepark – Consisting of 500 holiday homes, the largest waterpark in Northern Europe and wellness facilities, the project in west Jutland will require an investment of upwards of 1 billion kroner. The park is expected to cater to 620,000 overnight stays per year. 2. Vordingborg Municipality, Aquapark Møn – A tourist centre based on water, nature and outdoor activities, the park will have 500 units in an old sugar factory. The project would require an investment of about 1.3 billion kroner. 3. Sønderborg Municipality, Nordals Ferieresort – The project consists of two hotels, up to 400 holiday homes, two camping areas, a marina with 100 boat parking spaces, shops, and restaurants at a cost of about 1.3 billion kroner. It is expected to be able to attract 560,000 guests annually. 4. Lolland Municipality, Safari Lodge Knuthenborg – Connected to the already established Knuthenborg Safari Park, this project includes the establishment of up to 200 themed overnight units and connected conference and eating facilities. It is expected to be able to attract about 50,000 guests annually. 5. Stevns Municipality, Visitor Cente at Stevns Klint – The project consists of the establishment of a visitor centre, new parking area, playground, paths, new stairs and better lookout points for Stevns Klint (UNESCO World Heritage Site). It is expected to be able to attract about 50,000 guests annually. 6. Varde Municipality, Blåvand Strandpark – The project includes wellness facilities, 50 luxury apartments, a restaurant, boutiques, a clubhouse and a nature promenade that is expected to generate a turnover of 25 million kroner annually. 7. Hjørring Municipality, Løkken Klithotel –The project consists of replacing a worn-down hotel with a new hotel with 34 rooms, conference facilities, a restaurant, wellness centre, boarded pathways and a lookout point. It will require an investment of 25 million kroner. 8. Svendborg Municipality, Øhavscenter Christiansminde –The project plans for a new building with space for teaching, cafe, water sports, a promenade, bicycle path and new hotel rooms built into the terrain. It is expected to be able to increase tourism growth in Svendborg and the surrounding areas by up to 17 million kroner. 9. Gribskov Municipality, New Nordic Coast – The project plans for the establishment of a new beach hotel, pier and ocean bath, floating sauna and an activity area. It is expected to attract some 40,000 more guests to the area every year. 10. Norddjurs Municipality, Strandliv Fjellerup – This project aims to boost Fjellerup Beach by focusing on improving the 2.5 kilometre coastal area in order to make it even more attractive for tourists. Two other projects, a new promenade and pier at Marielyst in Guldborgsund Municipality and two coastal paths in Odsherred Municipality, were also approved within the boundaries of current legislation.